Several specimens of jade will be on display at the Wyoming State Geological Survey (WSGS) starting this month in celebration of the 50 years it has been Wyoming’s state gemstone. The WSGS building is on the University of Wyoming campus in Laramie. The public can view the display from 9 a.m. – 4 p.m., Monday through Friday. WSGS gems and minerals geologist, Wayne Sutherland, says it appears the designation of jade as the official state gemstone was spurred by both amateur and professional interests beginning in the 1930s and progressing through a jade rush that peaked in the 1960s before slowing in the 1970s. The 39th Wyoming Legislature passed the law, with formal adoption occurring Jan. 25, 1967. The state gemstone is nephrite jade. When found in Wyoming, it is referred to as “Wyoming Jade” due to its high quality and relative abundance in the state. Wyoming Jade is considered to be some of the finest nephrite in the world. Colors can range from white to black, with various shades of green being the most common. 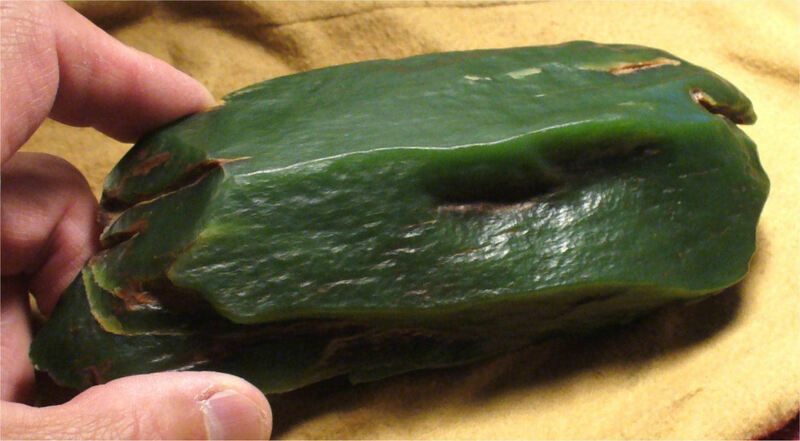 Its quality and durability are major factors behind Wyoming Jade’s high reputation. The stone’s moderate hardness combined with great durability makes it relatively easy to saw and carve into delicate yet resilient objects of art and adornment. "No other gemstone is comparable to Wyoming Jade for its beauty, its toughness and the adventure of finding it," says Sutherland. Early accounts of jade in Wyoming are anecdotal. One story involves a lapidary in Portland, Oregon, who in the early 1900s purchased apple-green Wyoming jade from cowboys who had traveled west to spend their winters. 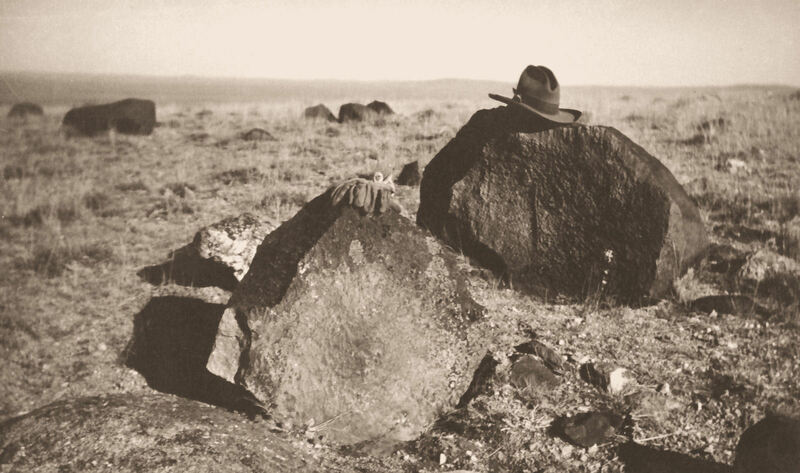 As another story goes, a sheepherder working in the Crooks Mountain area in 1931 brought a sizable piece of dark-green stone that he found to Lander. The stone turned out to be nephrite jade, and he sold it to a museum. The tale stirred up interest and inspired locals to hunt for jade. Jade has been found in Wyoming as far west as the Wind River Range and as far east as Guernsey and the Laramie Mountains. To the north, it has been reported in the Wind River Basin and near Thermopolis in the Bighorn Basin. It has been found as far south as Sage Creek Basin near the Sierra Madre. There are more than 50 specimens of jade included in the display at the WSGS varying in size and in shades of green, as well as black and gray. These specimens exhibit some of the diverse characteristics of our state gemstone, such as jade slicks with natural wind polish, and white to cream and red weathering rinds. Other pieces include snowflake jade, jade with quartz inclusions and jade breccia. Additionally, there is a 218-pound apple-green wind-polished slick boulder of Wyoming Jade permanently on display at the WSGS. The boulder was found by Ray and Irene Morgan in the 1940s on Crooks Mountain near Jeffrey City. The University of Wyoming Geological Museum, adjacent to the WSGS building, also has a mini jade exhibit displaying various stages of jade processing (raw jade to final carved products). Additional photos and information about jade deposits, the history of Wyoming Jade and the Wyoming jade rush can be found on the WSGS’ gemstones webpage. Various publications about jade can be downloaded for free from the Survey’s sales site. Currently, Mr. Sutherland is preparing an updated report on jade that will be published by the WSGS at a future date. Photo caption: A 1,000-pound boulder of apple-green jade near Crooks Mountain. Photo taken in 1944 by Bert Rhoads; from the J. David Love Collection, WSGS files.